TPC iSchematic Will Present Maintenance Downtime Reduction Case Study at the AISTech 2016 Conference. TPC iSchematic will unveil a customized solution to hydraulic machine maintenance downtime at the annual AISTech Iron and Steel Conference. TPC iSchematic’s case study will demonstrate how its customized TPC iSchematic process mapping application reduced hydraulic machine downtime on behalf of a major iron and steel producer. TPC iSchematic is scheduled to present a new white paper and case study at this year’s AISTech Iron and Steel Conference on May 16 - 19. The 2016 technical conference will feature more than 550 technical presentations covering advancements in all phases of iron production including steel making, rolling and finishing processes, and the various engineering, equipment and process technologies. TPC iSchematic’s case study will demonstrate how its customized TPC iSchematic process mapping application reduced hydraulic machine downtime on behalf of a major iron and steel producer. The presentation will further address how today's steel producers will use machine-specific training tools to develop the next generation of skilled workers as effective troubleshooters. In addition to the exhibition, TPC iSchematic will host a 30-minute technical presentation that discusses its unique solution to the steel industry's increasing demand for uptime to offset non-recoverable downtime. During the lecture, the case study will showcase the facility’s significant reduction in downtime and worker overtime after implementing iSchematic into their maintenance procedures. A question and answer session will follow the presentation. 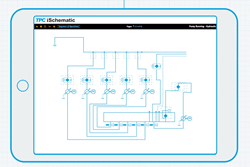 The web-based TPC iSchematic is the next evolution of process and system mapping for industrial and commercial facilities, placing every operation, task, and machine event at the fingertips of every worker. By mapping and maintaining critical system information on an interactive, mobile, updateable platform, iSchematic delivers proven results for reduced downtime, rapid onboarding, and more efficient facility operations. For more information about TPC iSchematic, including case studies, please visit http://www.tpctraining.com/ischematic. AIST has additional resources regarding their upcoming conference at https://www.aist.org/conference-expositions/aistech. You may also contact us at 800-837-8872 or at sales(at)tpctraining(dot)com. About TPC iSchematic: iSchematic is a division of TPC Training Systems, a privately held company with headquarters in Buffalo Grove, IL. The company offers a complete portfolio of training methods, including online, classroom, and on-the-job, and has helped more than 40,000 client sites globally to train over 3.5 million skilled workers. TPC iSchematic is a process and system mapping platform for enhancing productivity, safety, and process knowledge for workers in industrial facilities and commercial buildings.